Darken Your Hair with COFFEE. Have you ever thought of using coffee as a natural hair dye? Well, coffee has been used as a hair dye and treatment for a long time. Natural ground coffee is an excellent natural tool to darken hair. With the help of coffee, dark hair can acquire a beautiful healthy glow and even naturally dye your hair. At least once in your life, you’ve probably dyed your hair. I personally do it every 3 months. And let’s be honest, most natural store bought hair dyes can be quite pricey and sometimes they don’t work as well. So, why not make your own dyes using only natural ingredients such as coffee? You can darken your hair easily with coffee. Brew some very strong coffee. Pour the coffee into a bowl. In the shower, wash your hair with the coffee a few times. Wash your hair with your regular shampoo and conditioner. This is pretty simple process to make and you should see results very quickly indeed. The coffee should stain your hair. This will only makes your hair a few shades darker so if you are trying to make a drastic change, you are going to need to repeat the process a few times. Coffee can be used to darken all shades of hair but the best results are seen in light and medium shades of brown. 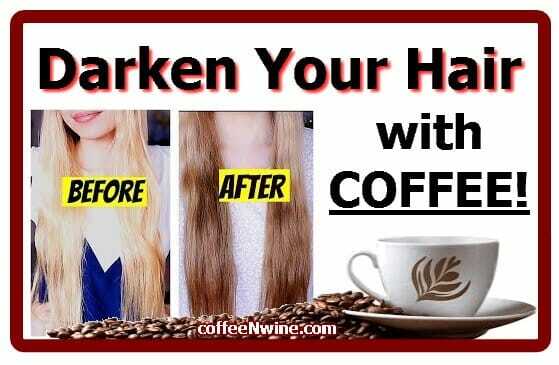 If you like this article “Darken Your Hair with COFFEE” please don’t forget to share it.